"It was easily the most stirring day so far in the unfolding of this famous case," began the Press Democrat coverage of the third day of Dr. Willard Burke's jury trial for attempted murder. "But we are promised more sensations, and therefore there are likely to be other even more eventful days." Yes, there were sensations aplenty at the Sonoma County courthouse that December, 1910, as the PD reminded us constantly in the headlines. "DAY OF SENSATIONS IN THE TRIAL OF DR. W. P. BURKE," was at the top of the front page one day. "SENSATIONAL EVIDENCE GIVEN AT TRIAL OF DR. BURKE" read another headline, and buckets of ink were used to announce "EACH DAY UNFOLDS NEW SENSATIONS IN THE TRIAL OF DR. W. P. BURKE." The articles found under these hyperventilated headlines weren't quite as twitchy, but they certainly offered more colorful writing than previous trial coverage in the Press Democrat, which had been a model for restrained and impartial court reporting. Every seat in the courtroom was filled within seconds after the door opening. "There were more women present, apparently deeply interested in the proceedings. Some of them smiled profusely when possibly some of the saddest secrets of the life of the woman on the witness stand were being laid bare." Presiding Superior Court Judge Seawell opened the session by ordering the bailiff to block minors from the proceedings. "His Honor wisely ruled that the trial was not one conductive to the uplift of boys and girls not yet out of their teens." Dr. Burke's Defense Attorney Rollo Leppo continued his cross-examination of Lu Etta. She denied threatening suicide or to kill her baby. She conceded she may have once said, "I wish I was dead," but denied she added, "If I had the means I would soon make it a fact." She denied "illicit relations with other men" and Leppo pressed hard to introduce questions that would suggest she was promiscuous. Judge Seawell shot down his attempts to ask about her "love imaginations," including that supposedly she said she was "violently in love" with a professor at UC/Berkeley "whom she was communicating with via telepathy." Lu Etta did testify that she had written several times to Wilson Fritch, "a lecturer on a 'new thought' said to incline to the teaching of Dr. Burke's philosophy of love," and arranged for him to speak at Burke's Sanitarium. Leppo also failed to coax her into saying that she had a father-daughter relationship with Burke, and the letter below was read aloud. The Press Democrat reported, "While they were being read one could almost have 'heard a pin drop' in the courtroom." You dear old doctor, and so you have not been practicing deception on me that is only negative all this time. You have not loved me in that way at all. You have been your kind old self and I have misunderstood. Well, now let us understand each other if we can, or I can. It is all right and I thank you very much. Of course you are old enough to be my father and that is what you have been and I am very grateful. But it is time I was going my way now and leaving you in peace. It will be all right. Mr. Fritch wanted to marry me last summer, but on account of the child I thought I ought not to do it. But I see you care nothing for the child and so goodbye. I shall go to the city the coming week. Goodbye more than father as ever. Leppo also read another letter from Smith written a couple of months after explosion. This note to Burke read, in part: "...I would like to go to Japan and if you can and want to raise the amount necessary, it seems to me it would be the best thing to do under the circumstances for all concerned. You intimated once that you might at some time give me twenty thousand dollars. If you will do that--a part now and the rest later--that will satisfy me and I will go my way and you go yours, and forget...Will meet you anywhere you desire to make a settlement." "Did you ever tell anybody that your child was born of immaculate conception?" asked Leppo. "I did not," said the witness warmly. "Did you tell Miss Waldron that Dr. Burke was the father of your child but that it was immaculately conceived?" "I told her that Dr. Burke was the father of my child but I did not tell her it was born of immaculate conception." "Did you not tell Miss Waldron that your child would be called the 'New Christ?'" "According to the general acceptance it was born of immaculate conception." [I] do not think my child was immaculately conceived. In the East India Hindu religion, I do. I did not tell any one that I knew nothing about what happened at the time my child was conceived for twenty-four hours, and that I had been either drugged or hypnotized." "I have never said that my child was of immaculate conception in the generally accepted sense. I wish that understood." "I am sure," said the witness, "that Dr. Burke wrote me a letter, saying that my child was of immaculate conception." "Where is that letter?" asked Leppo. "Who destroyed that letter?" demanded Leppo. "I did not," quietly replied the woman. The witness was asked to explain the Hindu idea of "immaculate conception, which denies the spiritual fatherhood and maintains there was a physical conception on a higher plane." "Dr. Burke said he believed that way," insisted Miss Smith. "He said the child had been born on a higher plane and I believed what he said. I doubt it now." Leppo did not press for further explanation of what she believed (or what she thought Dr. Burke believed), for which the courtroom was probably deeply grateful. The Press Democrat tried to make some sense of her notions in a special sidebar, but ended up leaving Gentle Reader lost farther out in the weeds: "...Christ was the son of Joseph and Mary and the conception was both physical and immaculate, the latter on account of its spirituality. She at first believed the conception of her own child to have been immaculate, in the sense that it was upon this 'higher plane,' but later when Dr. Burke declined to properly care for the child she changed her mind..." Thanks, PD editor Ernest Finley, that was oh, so helpful. 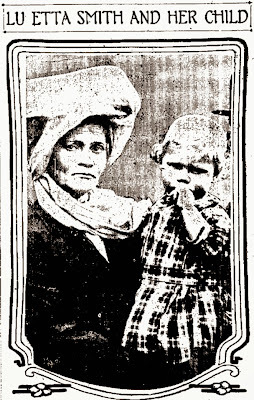 Lu Etta Smith returned to the stand the next day for her fourth and last day of testimony - and this time, brought her toddler to court and held him in her lap through most of the proceedings. "The youngster made many friendly overtures to those around him," the Press Democrat reported. "...The baby smiled and chattered and waved its little hands at the crowd in the courtroom. The spectators smiled back at the baby, who seemed rather to like the attention being showered upon it." Although evidence suggests Derrigg consistently acted as a bagman in Dr. Burke's efforts to implicate Lu Etta in the explosion, Smith testified she considered Derrig a good friend and a confidant who even "once offered me money with which to sue Dr. Burke." Amazingly, there were apparently no followup questions to that remarkable assertion. Lu Etta said she wanted to go to Japan to avoid the trial, Derrigg gave her $750 total, including $500 on the day she sailed. Derrigg insisted she give the fake name of "Mrs. E. L. Long" for the steamer's passenger manifest. Once in Japan, Lu Etta testified she wrote three letters to Derrigg asking for money to support her and the baby, but received no reply. She also sent a cablegram to Dr. Burke, who also did not answer. Out of money, she willingly returned to the U.S. "She was asked whether she would have stayed in Japan had money been sent her. 'I should have stayed,' was the quiet reply." Thus ended Lu Etta Smith's testimony, but there were other witnesses that day. Nurse Lois Clausen told the court that Dr. Burke spoke to her the morning after the explosion, saying: "It is too bad it did not kill her. She would be better off dead. The child would be better off with another mother." Mrs. Anna Macey took the stand and stated Lu Etta was at her boarding house in San Francisco for several months around the time Smith became pregnant. Dr. Burke was a weekly visitor, she said. The doctor's visits were always about an hour long. "I know that he paid for her room and board while she was at my house. She had no income and I know she kept company with no other men while there. On the occasions of Dr. Burke's visits he always went into her room." 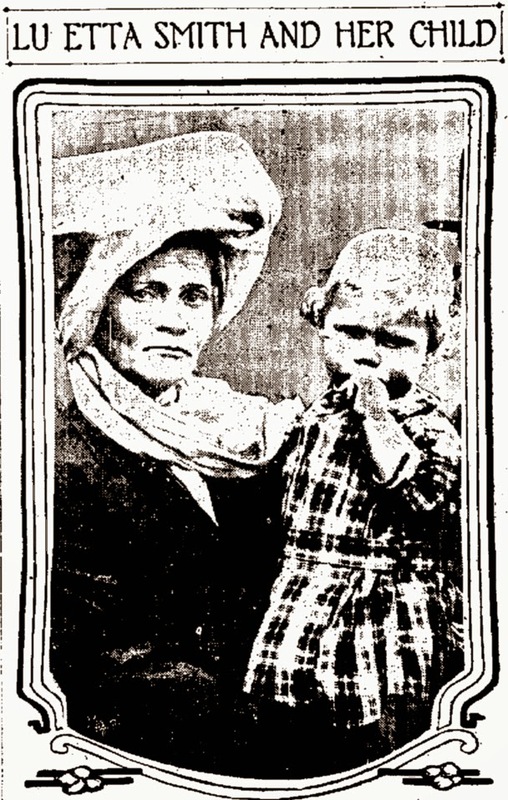 She knew Lu was "in a delicate condition" when she left in Feb. 1909. Mrs. Macey testified that Frank Golden, a lawyer of San Francisco, and a relative of Dr. Burke, called at her house after the explosion with Mrs. Golden, who is a stenographer, and represented to her that he was "from the District Attorney's office." Later when the conversation was half over, Mrs. Macey testified that Golden told her who he was. Mrs. Macey further testified that when other people called subsequently and stated that they were "from the District Attorney's office" she slammed the door in their faces, not caring for any further deception.